[LONDON: March 2017]: A new neighbourhood today announces agreements for the first commercial spaces at Royal Wharf. 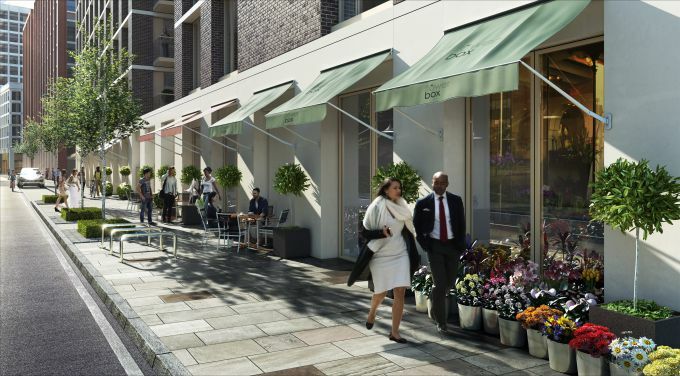 When complete, Royal Wharf will be a vibrant and bustling neighbourhood centred around a Marylebone style high street and local market square, Sovereign Place, with shops, restaurants, bars and cafes leading to a network of leafy streets and squares. Situated on 40 acres of riverside land, the residential development includes suites, one, two and three bedroom apartments as well as three and four bedroom townhouses. Located in the heart of London’s Royal Docks £3.5bn regeneration area, the development is an exciting new destination for Londoners to live, work and visit. New commercial tenants announced today include some of the nation’s best known retail outlets including Sainsbury’s, Starbucks, Fullers, Life Residential, Johns & Co and a new NHS facility. Starbucks will be one of the first businesses to open at Royal Wharf, with an agreement in place to occupy a sizable 1,750 sq. ft. unit. Located at the entrance to the development just moments from Pontoon Dock DLR station, the popular outlet will inhabit a convenient location for residents to buy coffee as they start their morning commute. The pub chain Fullers have agreed to occupy a prime commercial space in the first phase of the development with a space in excess of 3,000 sq. ft in size. The new Fullers pub will have a direct river frontage and also an outdoor area for alfresco eating. In addition, Sainsbury’s will be occupying a 3,961 sq. ft. retail unit while Life Residential and Johns & Co have also committed to locate flagships offices in the development. In addition there will be a new NHS facility providing healthcare support for the surrounding community occupying a 11,000sq ft facility. The buildings themselves are inspired by the traditional Georgian architecture of Belgravia and Fitzrovia, in keeping with the classic character of London yet contemporary in style. The developers, Oxley and Ballymore, have made full use of the industrial materials reflected in the surrounding docklands, all in all creating a rich variety of architectural styles that will stand the test of time. Moments from Canary Wharf, Royal Wharf has outstanding transport links to central London. Travelling from Pontoon Dock and West Silvertown on the DLR or Canning Town on the Jubilee Line will enable residents to reach the West End in 20 minutes, Canary Wharf in five minutes and London City Airport in two minutes. In 2018 a new Crossrail station at Custom House will mean that residents can reach Heathrow Airport in just 41 minutes and the West End in 15 minutes. In addition, the Emirates Air Line, London’s only cross-river cable car, is a short walk away. The first homes in the development are now complete and the first residents have started to move in. A section of the 500m riverfront promenade which borders the riverside edge of the development is now open, bringing the vision for the development to life. Further images are available on request. To register interest go to www.royalwharf.com or call 0800 160 1200.